The adventure to explore the thrill of gazing through the forest to get a glimpse of the world famous royal Bengal tiger and an endangered species of white crocodile is captivating. 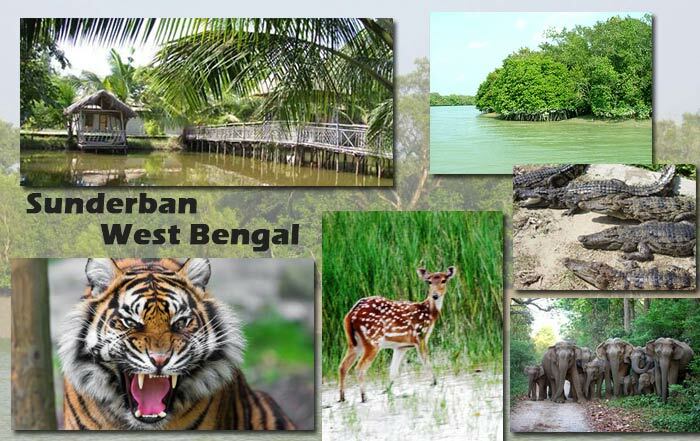 Sunderban national park is one such Tiger reserve. Sunderbans as we all know is a famous national park which is located in the 24 Paraganas district of West Bengal which got its name from one of the mangrove plants known as Sundari. They are a part of the world’s largest delta formed by the rivers Ganges, Brahmaputra and Meghna. The core area of the park has its own natural boundaries with the river Matala on its West, the river Haribhanga on its East and Netidhopani and Gosaba in the North. The region has a wide variety of birds, reptiles and mammals, out of which the main attractions are the Bengal Tiger, Cheetal, Monitor Lizard, Estuarine Crocodile, snakes and the Olive Ridley Turtle. Though there is a total ban on the killing or capture of the wildlife, still many of these species are being considered as endangered. We planned our maiden trip to the Sunderban national park during winters in the month of January. To get to the Sunderbans national park, the nearest airport is Kolkata, the nearest railway station is Canning, and the nearest town is Gosaba. After reaching Kolkata, we took a local train to Canning and from there we took the house boat which was the inception of our journey. We floated in luxury and explored the abode of heavenly flora and fauna. The house boat had four cabins with bed, a bath room, a kitchen and a deck area for bird watching along with a big dining area that would accommodate for at least 10 people at a time. Well equipped with all the amenities, our each and every need was impeccably taken care of in the houseboat. At 10.30 a.m. we started our journey. We got mesmerized by the serene thrill of the Sundarbans. The best way to explore the Biosphere Reserve and its delta is on a boat. We sailed through the narrow rivulets and experienced the exotic wizardry of the Jungle. We got an opportunity to dive in the lap of pristine nature and got close to the wild habitat. Being secluded from the rest of the world, the chaos and crowd is absent here. The place is inhabited by a bevy of amazingly unique creatures and we also came across many hospitable people who reside here. At 11.00 a.m. we were served the freshly prepared hot parota and aaloor dum (Paratha and Aaloo ki sabzi). The delectable delicacy during the winters in the midst of the cruise came as a surprise and also as a pleasure to us since we were already starving by that time. The experience of watching the variety of birds while having breakfast was something out of this world. Since the forest was dense and even a single noise would break through the serenity of the place, we were constantly keeping a watch over the edges, with the hope of getting a glance of any wild animal. After sailing for two hours we reached Gosaba. We went to see the house where Rabindranath Tagore resided when he visited Gosaba. This house was made by Sir Daniel Hamilton for him. It is a small wooden structure that reminded of the British era. At Gosaba, we were served hot luncheon consisting of Rice, Murighanta Dal, Beguni, Vegetable, Prawn, Bhetki Fish, Chatni, Papad, and Curd. By evening we reached Sajnekhali and stayed at a hotel. The alley to the hotel from the river was really exhilarating as it was a narrow swampy expanse. After reaching the hotel we got freshened up and were then called upon to watch the famous ‘jhumur Dance’. To our utmost contentment the beautiful tribal dance and the songs were bewildering. Not only we got the opportunity to watch it but also participated in their dance, which was fun. The delectable delicacies like Mutton biriyani, Chapati, Daal and Mutton Kosha were served in the dinner. Next day we went to the Sunderban tiger reserve, where the localites revere ‘Banbibi’ – The Goddess of forest and offer puja before entering the forest to protect them from the wild animals. We offered the puja and started our journey inside the forest with utmost anxiety to face the man-eater of Sunderban, known to be the most antagonistic species. Despite the guide navigating us well through the forest, a sudden dissipating sound would leave us frightened. After walking for an hour, the guide suddenly pointed towards a call being made by the monkeys and barking dear and asked all of us to be quiet. And then we witnessed the sight that was inconceivable! A royal Bengal tiger was sitting just a few meters away from us behind the thick bushes. We got goosebumps and were so electrified that we almost forgot that we were in the midst of the dense forest and should restrain ourselves to be chaotic. The distraction was enough for the creature to leave the place hastily. We left the place heavy heartedly as we wanted to watch it for longer. While returning we saw the huge pug marks of a tiger. Another guide told us that only a few minutes back the tiger had killed a dear. The guide told us to look out for the tiger from a tree top and we climbed up the watch tower to get another glimpse of the animal. Back on the cruise, after almost an hour, we saw something huge and white in color lying down on the beach. After a while we found it moving and then realized that it was a gigantic Estuarine Crocodile almost 10 ft. long, which was sure to send chills up the spine. It seemed that the crocodile was taking a sun bath. For almost five minutes we tried capturing it from various angles. The commotion led the crocodile dive deep into the water. The trip to the Sunderbans has made a remarkable passage into our heart. The two night three days excursion offered by the travel agencies are available with the guide services. Boating is the next best thing to do in the Sunderbans, since the entire territory of the forest floats on water. A ride through the sparkling waters can be a fun experience, so in order to spend a memorable vacation in Sunderbans, take a ride in the motor boats available here. Boating in Sunderbans is safe, because most of the boats are equipped with safety features and life jackets. When to visit – The best time to visit Sunderbans is during winters between December and February, although the park remains open for a much longer time – from September to March. This is the period when one would find the maximum number of migratory birds. Share the post "A Tryst with the Bengal Tiger – Reminiscing an expedition to the Sunderbans"